Polycythemia vera (PV) is a chronic blood disorder marked by an abnormal increase in three types of blood cells produced by bone marrow: red blood cells (RBCs), white blood cells (WBCs), and platelets. PV is called a myeloproliferative disorder, which means that the bone marrow is producing too many cells too quickly. Most of the symptoms of PV are related to the increased volume of the patient's blood and its greater thickness (high viscosity). PV sometimes evolves into a different myeloproliferative disorder or into acute leukemia. Polycythemia vera is a relatively common progressive disorder that develops over a course of 10-20 years. In the United States, PV affects about one person in every 200,000. PV has several other names, including splenomegalic polycythemia, Vaquez-Osler syndrome, erythremia, and primary polycythemia. Primary polycythemia means that the disorder is not caused or triggered by other illnesses. PV most commonly affects middle-aged adults. It is rarely seen in children or young adults and does not appear to run in families. The male/female ratio is 2:1. The cause of PV remains uncertain. In general, the increased mass of red blood cells in the patient's blood causes both hemorrhage and abnormal formation of blood clots in the circulatory system (thrombosis). The reasons for these changes in clotting patterns are not yet fully understood. The symptoms of early PV may be minimal—it is not unusual for the disorder to be discovered during a routine blood test. More often, however, patients have symptoms that include headaches, ringing in the ears, tiring easily, memory problems, difficulty breathing, giddiness or lightheadedness, hypertension, visual problems, or tingling or burning sensations in their hands or feet. Another common symptom is itching (pruritus). Pruritus related to PV is often worse after the patient takes a warm bath or shower. Some patients' early symptoms include unusually heavy bleeding from minor cuts, nosebleeds, stomach ulcers, or bone pain. In a few cases, the first symptom is the development of blood clots in an unusual part of the circulatory system (e.g., the liver). As the disease progresses, patients with PV may have episodes of hemorrhage or thrombosis. Thrombosis is the most frequent cause of death from PV. Other complications include a high level of uric acid in the blood and an increased risk of peptic ulcer disease. About 10% of PV patients eventually develop gout; another 10% develop peptic ulcers. The spent phase is a development in late PV that affects about 30% of patients. The bone marrow eventually fails and the patient becomes severely anemic, requiring repeated blood transfusions. The spleen and liver become greatly enlarged—in the later stages of PV, the patient's spleen may fill the entire left side of the abdomen. PV is often a diagnosis of exclusion, which means that the doctor will first rule out other possible causes of the patient's symptoms. The doctor can detect some signs of the disorder during a physical examination. Patients with PV will have an enlarged spleen (splenomegaly) in 75% of cases. About 50% will have a slightly enlarged liver. The doctor can feel these changes when he or she presses on (palpates) the patient's abdomen while the patient is lying flat. An eye examination will usually reveal swollen veins at the back of the eye. Patients with PV often have unusually red complexions; mottled red patches on their legs, feet, or hands; or swelling at the ends of the fingers. Accurate diagnosis of PV is critical because its treatment may require the use of drugs with the potential to cause leukemia. The results of the patient's blood tests are evaluated according to criteria worked out around 1970 by the Polycythemia Vera Study Group. The patient is considered to have PV if all three major criteria are met; or if the first two major criteria and any two minor criteria are met. BLOOD TESTS. The diagnosis of PV depends on a set of findings from blood tests. The most important single measurement is the patient's red blood cell mass as a proportion of the total blood volume. This measurement is made by tagging RBCs with radioactive chromium (51Cr) in order to determine the patient's RBC volume. While a few patients with PV may have a red cell mass level within the normal range if they have had recent heavy bleeding, a high score may eliminate the need for some other tests. A score higher than 36 mL/kg for males and 32 mL/kg for females on the 51Cr test suggests PV. Measurements of the oxygen level in the patient's arterial blood, of the concentration of vitamin B12 in the blood serum, and of leukocyte alkaline phosphatase (LAP) staining can be used to distinguish PV from certain types of leukemia or from other types of polycythemia. LAP staining measures the intensity of enzyme activity in a type of white blood cell called a neutrophil. In PV, the LAP score is higher than normal whereas in leukemia it is below normal. BONE MARROW TESTS. Bone marrow testing can be used as part of the diagnostic process. A sample of marrow can be cultured to see if red blood cell colonies develop without the addition of a hormone that stimulates RBC production. The growth of a cell colony without added hormone indicates PV. Bone marrow testing is also important in monitoring the progress of the disease, particularly during the spent phase. GENETIC TESTING. Genetic testing can be used to rule out the possibility of chronic myeloid leukemia. Patients with this disease have a characteristic chromosomal abnormality called the Philadelphia chromosome. The Philadelphia chromosome does not occur in patients with PV. Imaging studies are not necessary to make the diagnosis of PV. In some cases, however, imaging studies can detect enlargement of the spleen that the doctor may not be able to feel during the physical examination. Treatment of PV is tailored to the individual patient according to his or her age, the severity of the symptoms and complications, and the stage of the disease. Phlebotomy is the withdrawal of blood from a vein. It is the first line of treatment for patients with PV. Phlebotomy is used to bring down the ratio of red blood cells to fluid volume (the hematocrit) in the patient's blood to a level below 45%. In most cases the doctor will withdraw about 500 mL of blood (about 15 fluid ounces) once or twice a week until the hematocrit is low enough. Phlebotomy is considered the best course of treatment for patients younger than 60 and for women of childbearing age. Its drawback is that patients remain at some risk for either thrombosis or hemorrhage. Myelosuppressive therapies are used to slow down the body's production of blood cells. They are given to patients who are older than 60 and at high risk for thrombosis. These therapies, however, increase the patient's risk of developing leukemia. The substances most frequently used as of 1998 include hydroxyurea (Hydrea), interferon alfa (Intron), or radioactive phosphorus (32P). 32P is used only in elderly patients with life expectancies of less than five years because it causes leukemia in about 10% of patients. Interferon alfa is expensive and causes side effects resembling the symptoms of influenza but is an option for some younger PV patients. The Food and Drug Administration (FDA) has approved the use of anagrelide, an orphan drug, for investigational use in the treatment of PV. Anagrelide has moderate side effects and controls the platelet level in over 90% of patients. The itching caused by PV is often difficult to control. Patients with pruritus are given diphenhydramine (Benadryl) or another antihistamine. Patients with high levels of uric acid are usually given allopurinol (Lopurin, Zyloprim) by mouth. Supportive care includes advice about diet—splenomegaly often makes patients feel full after eating only a little food. This problem can be minimized by advising patients to eat small meals followed by rest periods. Because of the clotting problems related to PV, patients should not undergo surgery until their blood counts are close to normal levels. Female patients of childbearing age should be warned about the dangers of pregnancy related to their clotting abnormalities. Anagrelide — An orphan drug that is approved for treating PV patients on an investigational basis. Anagrelide works by controlling the level of platelets in the blood. Leukocyte alkaline phosphatase (LAP) test — A blood test that measures the level of enzyme activity in a type of white blood cell called neutrophils. Myeloproliferative disorder — A disorder in which the bone marrow produces too many cells too rapidly. Myelosuppressive therapy — Any form of treatment that is aimed at slowing down the rate of blood cell production. Orphan drug — A drug that is known to be useful in treatment but lacks sufficient funding for further research and development. Philadelphia chromosome — An abnormal chromosome that is found in patients with a chronic form of leukemia but not in PV patients. Phlebotomy — Drawing blood from a patient's vein as part of diagnosis or therapy. Phlebotomy is sometimes called venesection. It is an important part of the treatment of PV. Pruritus — An itching sensation or feeling. In PV the itching is not confined to a specific part of the body and is usually worse after a warm bath or shower. Spent phase — A late development in PV leading to failure of the bone marrow and severe anemia. Splenomegaly — Abnormal enlargement of the spleen. 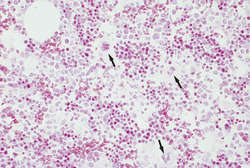 Splenomegaly is a major diagnostic criterion of PV. The prognosis for untreated polycythemia vera is poor; 50% of patients die within 18 months after diagnosis. Death usually results from heart failure, leukemia, or hemorrhage. Patients being treated for PV can expect to live between 11 and 15 years on average after diagnosis. a chronic form of polycythemia of unknown cause; characterized by bone marrow hyperplasia, an increase in blood volume as well as in the number of red blood cells, redness or cyanosis of the skin, and splenomegaly. Chronic polycythemia caused by a genetic mutation affecting hematopoietic stem cells, characterized by increased blood volume, bone marrow hyperplasia, redness of the skin, and splenic enlargement. Synonym(s): erythremia, Osler disease, Osler-Vaquez disease, polycythemia rubra, Vaquez disease. Usually occurring between ages 40 and 60 and most common in males with Jewish ancestry, polycythemia seldom affects children or those of African ancestry. Weakness, fatigue, headache, blood clotting, vertigo, tinnitus, irritability, dyspnea, visual disturbances, flushing of face, redness, or ruddy cyanosis, pruritus, ecchymosis, hypertension, epigastric distress, weight loss, and pain in joints or extremities occur commonly. The bone marrow shows uncontrolled, rapid cellular reproduction and maturation (increased cellularity). Peptic ulcers are often reported. The mainstay of patient care is the reduction in red blood cell mass with recurrent phlebotomy to lower the hematocrit to 45% or less. Vitals signs are monitored during and after phlebotomy, and the patient is provided with oral fluids and protected from orthostatic hypotension. The symptoms and the need to seek medical attention when signs and symptoms of bleeding and thrombus formation occur are explained to the patient. Rest should be balanced with exercise, but the patient should be advised that activity and ambulation help prevent thrombotic complications. Reassurance and support are provided to the patient and family, and opportunities are provided for questions and discussion of concerns. Patients who have a history of blood clotting or very high platelet counts are treated with myelosuppressive drugs, such as hydroxyurea. During myelosuppressive therapy the patient is informed about adverse effects that may occur, assessed for leukopenia and thrombocytopenia, and protective measures are taught and instituted. Louis H., French physician, 1860-1936. Chronic form of polycythemia of unknown cause. an increase in the circulating red blood cell mass. Primary polycythemia is a myeloproliferative disorder of unknown etiology. It occurs as an inherited defect in cattle and is a rare disease in dogs and cats. There is hyperplasia of the cell-forming tissues of the bone marrow, with resultant elevation of the erythrocyte count and hemoglobin level, and an increase in the number of leukocytes and platelets. Called also polycythemia vera. Secondary polycythemia is a physiological condition resulting from a decreased oxygen supply to the tissues, caused by living at high altitudes, heart disease, circulatory insufficiency or severe pulmonary disease, or the production of erythropoietin or erythropoietin-like compounds, as in polycystic kidney disease, hydronephrosis or renal neoplasms. an increase in total hemoglobin and red cell mass with a normal plasma volume. May be a primary or secondary polycythemia. a secondary polycythemia, occurring in response to impairment of oxygenation. occurs as an autosomal recessive trait in Jersey cattle. See primary polycythemia (above). an inherited defect of cattle. Clinically there is dyspnea. apparent polycythemia resulting from loss of plasma and the hemoconcentration that follows. 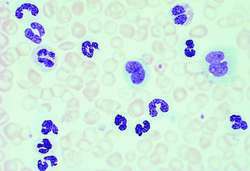 Called also spurious polycythemia. However cases with clinicomorphological and laboratory features favoring polycythemia vera should be tested for other mutations. JAK2 gene mutation is seen in significant proportion of these disorders (69%) and it can be used to differentiate between polycythemia vera and secondary polycythemia in most cases with near certainty, where it was found in 100% of the cases. Table 2: Differential clinical and laboratory Features in polycythemia vera and secondary polycythemia according to Dameshek, 1950 (1). Polycythemia vera is a chronic, myeloproliferative disease not related to Bcrl-abl genotype. Markers of myeloproliferative diseases in childhood polycythemia vera and essential thrombocythemia. All patients with BCS warrant a hypercoagulable work up and JAK2 mutation is increasingly recognized as a contributing factor, even in those patients without obvious signs of polycythemia vera. The WHO diagnostic criteria for polycythemia vera, essential thrombocythemia and primary myelofibrosis. The main area of focus for the JAK2 program has been the development of orally available JAK2 inhibitors to treat myeloproliferative disorders, which include myelofibrosis, polycythemia vera (PV) and essential thrombocythemia (ET). Although the JAK2 mutation linked to ALL differs slightly from the defect in polycythemia vera patients, research into JAK2 inhibitors already under way for that disease could speed drug development for ALL patients with Down syndrome, Izraeli says. Patients with Polycythemia Vera undergo therapeutic phlebotomies on a routine basis to decrease their hematocrit.